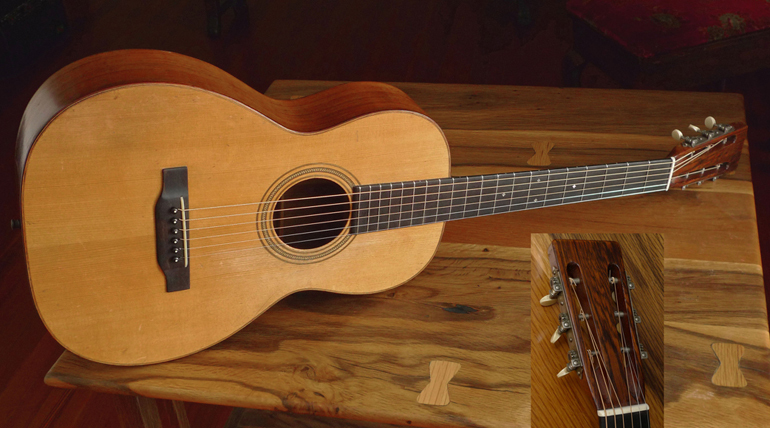 This is a wonderful Martin 0-21, but with “the best of both worlds”: the light build of 1924– combined with 1930’s robust, “braced for steel” construction. It left the factory in 1924, but it went back to Martin in 1934 for a neck set, new belly bridge, and to get set up fully for steel strings. Original “arrowhead” design tuners. The first Waverly tuners showed up in 1924/25 and remained until after the war. The arrowhead design, seen here on the tuner plates, showed up also in 1924, still with the shafts placed underneath the gears / string posts. Crack free (there is one cleat inside guitar, on upper bout, back. There is no visible crack that goes through wood to inside, just a tiny finish crack on outside. 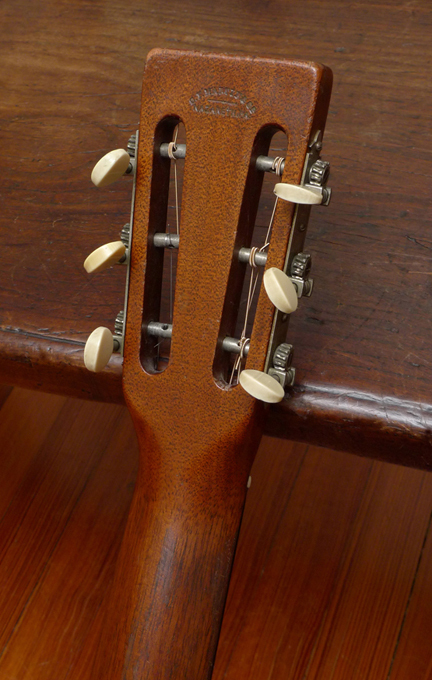 No doubt the Martin luthier place the cleat there in 1934 as a preventative measure (that worked). The combination of the original thin-profile neck, with the braced-for-steel modifications by Martin factory in 1934, make for a very robust guitar– you can play it hard and it holds up and projects like a 30’s Martin. June 20, 1933: the owner wrote to Martin that instrument needed a neck set and the bridge was “adrift”. Martin replied on June 23 that the normal guarantee would probably cover this work. 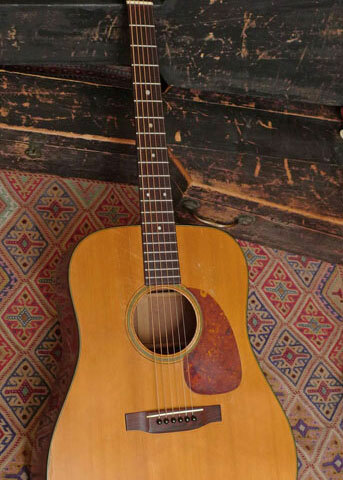 Owner sent the guitar to Martin on July 3, 1934. 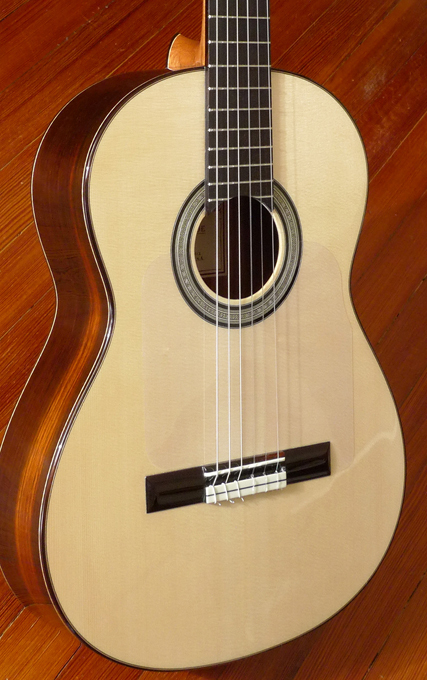 Martin reported back to owner on July 16 that readjusting the neck and regluing the bridge would be covered by the warranty, Martin also offered a “new” bridge (meaning belly bridge) for $1.50. Martin also said that some binding could be reglued and repaired for $3.00. Work done at Martin, July 1934. 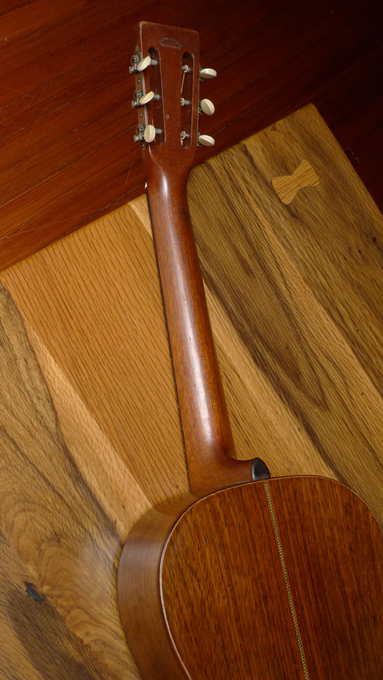 The luthier at Martin replaced the bridge with a 1934 spec ebony belly bridge, and replaced the bridge plate with a perfect, tucked, small maple bridge plate. 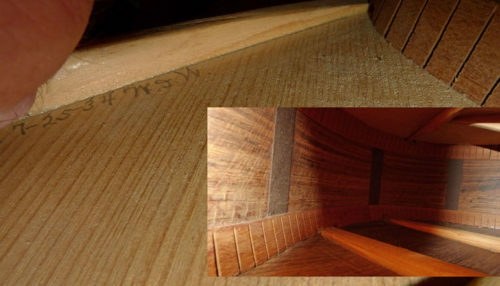 Martin luthier signs underside of spruce top: “7-25-1934”, and put his initials (“W.T.W.”), right by the edge of the X-brace to the top/upper bout. Of course, the back was taken off the guitar to do the above work. 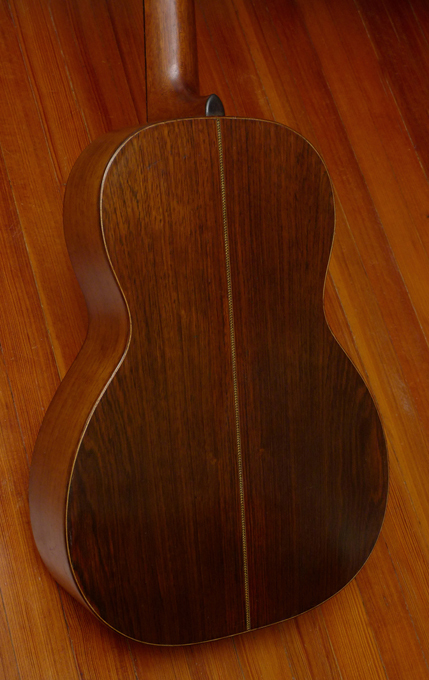 But being perfectly done at Martin factory in 1934, there are no visible signs of that– back binding is perfect. Total repair bill from Martin factory in 1934: $4.50. Paid by check, and Martin return ships the 0-21 to owner on August 15th, 1934. The 21 model is, of course, the cousin to the 28. 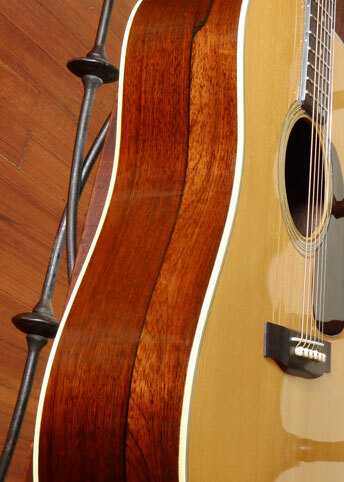 Same combination of brazilian rosewood back and sides, and Adirondack spruce top, and ebony bridge and fingerboard. 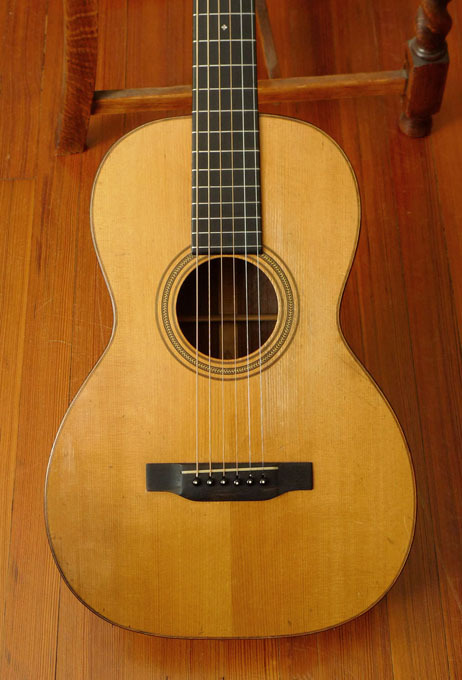 1930’s 12 fret Martin 0-21’s are very rare. There was only one made in 1934. 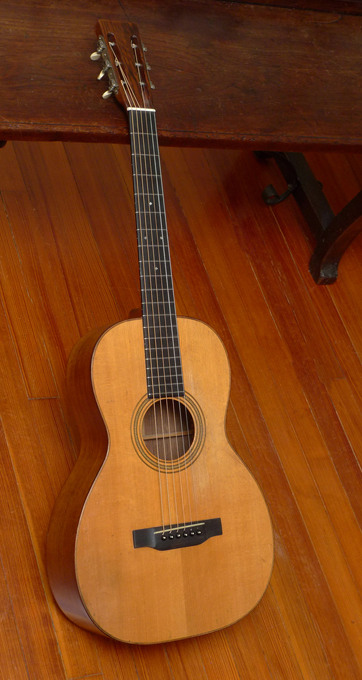 Between 1932 and 1939– the entire “golden age” at Martin, there were less than 100 made.